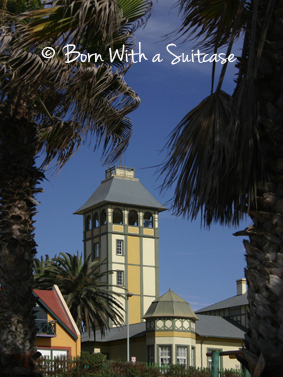 Some of the best preserved examples of German colonial architecture in the world are a striking feature of Swakopmund. This Namibian desert oasis clings to the western edge of southern Africa as the last bastion of German heritage. Along a spotless, peaceful beach dotted with palms and quaint villas, I meander through perfectly manicured and well watered green parks toward the centre of town. In the shopping precinct, quaint shops line the immaculate paved streets and through a charming shop window I admire souvenirs. I try to enter but it is locked with a prison style barricade, so peering through the window I check to see if the shop is open. At the counter, a stout woman with Aryan features presses a button to open the doors. ‘Come in!’ she bellows in her harsh abrasive accent. Bewilderingly, the next shop is also barred, and I notice a sign over the entrance proudly stating ‘entry reserved’. I had never given Namibia’s history much thought before but some quick research reveals the Republic of Namibia was formerly annexed by South Africa and only attained independence in 1990. As a result, South Africa’s former child struggles to cut the apron strings and still retains the last bastion of apartheid. Feeling indignant at my ‘special’ treatment, but more so by my naivety, I promptly leave the shop as the thin veneer of deceit crumbled to reveal a dark history. Back at the motel, I waste no time in finding out about the local township, discover there is a tour tomorrow, and promptly book it. The minibus arrives in Mondesa amidst a commotion of people living their daily lives and laughing children, dressed in brightly coloured rags, playing in the street. A crowd of children pose and play silly antics as I take photos. They gather round as I display the pictures back to them on my camera. ‘Swing,’ excitedly yell two vibrant six-year-old girls as they grab my hand and position themselves in between the grip of a fellow tourist. We indulge them as they delight in this simple pleasure. With no parents in sight, the youngsters remain under the watchful eye of neighbours relaxing on porches as upbeat, pulsating rhythms emanate from their portable radios. We are directed inside a bland grey brick two bed room home. Here we have the opportunity to meet an elder who is from the Damara tribe. Her name is Lena Moses but we are encouraged to call her Oma, (German for grandma or elder). As with most older women from her tribe she still dresses in a colourful, voluminous, Victorian-style dress. The unusual tradition stems from the influence of the early missionary wives from the early nineteenth century. The distinctive headdress, with its two points, symbolizes cattle horns and originates from the Herero culture. Despite the fact Lena is fluent in three different languages, English is not one of them so the tour guide acts as our interpreter. We ask all kinds of questions about her culture. As Lena’s boisterous grand children jump all over her she gives a historical account of her life. ‘I was brought up in Swakopmund and had a very happy childhood with my parents and siblings. In the 1940s all that changed when we were forced to live in the township (Mondesa). My father was a white man of German descent and the new government which enforced Apartheid forced him to return to Germany. I was ten years old and I never saw my father again’, she recounts stoically, and then curtly reprimands one of the children for being too rough. The saga is poignant but common and I try to imagine how hard her mother’s life would have been. It raises more questions in my mind, but sadly it is time to leave. We then learn about other ethnic groups living within the township by meeting a Nama medicine man, hearing the Khoisan ‘click’ language. In a traditional rondavel (round African thatched hut), we indulge in some African delicacies, including omagungu (dried mopane worms), which I politely declined to put on my plate, and were then treated to a performance of the Ovambo dance by the local children. Further down the potholed road, in the informal, makeshift Democratic Resettlement Community (DRC), we spend some time relaxing in the local shebeen (bar) and played pool with the locals. Then it is time to visit a unique home belonging to Ernst and Elsie. Ernst makes a living by painting T-shirts for tourists and by inviting tourists to his home for tea. Unbelievably, their house is made entirely of recycled objects from the nearby rubbish dump. Please look through our house’, Ernst offers. Brightly painted hessian obscures ramshackle tin walls, hanging to the dirt floor disguised by an emaciated layer of linoleum. In the kid’s bedroom a rickety bunk bed is piled with stuffed toys, hinting happiness and harmony. Despite the rudimentary conditions, the house is indeed a home and a spotless one at that. Once in the lounge room I reel at the sight of a coffee table fashioned from an elephant’s foot. I’m hoping it wasn’t a poached pachyderm but a controlled cull. Despite the repugnancy, I still manage to complement Ernst on their wonderful home. ‘Thankyou’, Ernst replies shyly as he proudly accepts the accolade. Elsie emerges from the kitchen carrying a tray with her best tea set. Being mindful of the water being hand carted from the community pump, I humbly sip the mint tea, fully appreciative of the hospitality as it nears time to leave. Standing on the porch, made out of upturned beer bottles embedded in concrete, the family heartily wave goodbye as if we were visiting relatives. Sitting back on the bus, I could now see the top of their angled roof. An old billboard, held in place by old car tyres, advertises plush apartments. Meeting Mondesa, Swakopmund’s hidden township has certainly been the highlight of the trip to Namibia. This entry was posted in Namibia, Responsible Travel and tagged Adventure, lone female, Mondesa, Namibia, Responsible Travel, Southern Africa, Swakopmund, Township on November 16, 2006 by Wogolin.